As you may know already, Friday night at my place is cheese making night. It has become a regular institution, whereby Kim leaves the milk out on the kitchen bench for me and as soon as I get home, I start to set up and sterilise the equipment as she serves up dinner. Tonight I am making a simple blue cheese using the recipe from Ricki Carroll’s Home Cheese Making book which uses 2 gallons or 8 litres of milk. It is easy to follow, and I am currently about 5 hours into the process with about an hour to run until it is time for bed. Sushi mats on top and bottom of the moulds. I used 14 litres of milk and adjusted the recipe to suit. I ended up with these two smaller cheeses which are in Camembert hoops. I also had enough curd for this very large cheese. Now all I have to do is find a container large enough for it to fit in to keep it humid enough in the cheese fridge. As they mature, I will show you what happens as the blue mould grows. This recipe is very quite similar to making Camembert, with the aftercare of Stilton. A bit of a hybrid cheese. After about 3 days of drying and salting, I pierce each one with many holes so that the bacteria can breath and make the blue mould. Then they go into the humid cheese fridge. I love this cheese, so I wanted to share my Stilton video tutorial with you. 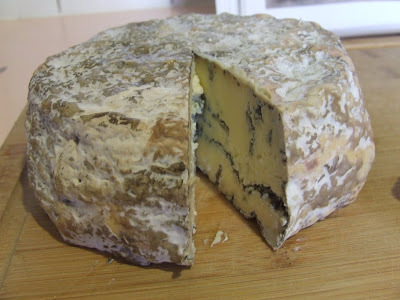 As I mentioned in the previous post Stilton, a type of blue cheese that hails from England, just has it all. So creamy, and smooth with that unbelievable blue vein flavour. This is the fourth time I have make this cheese, and it just gets better and better as I learn how to make it. I am now confident with my method that I am able to share it with you all. Please enjoy my Stilton video tutorial on how to make Stilton cheese. A good blue cheese, a nice red wine and great friends is all anyone could ask for! 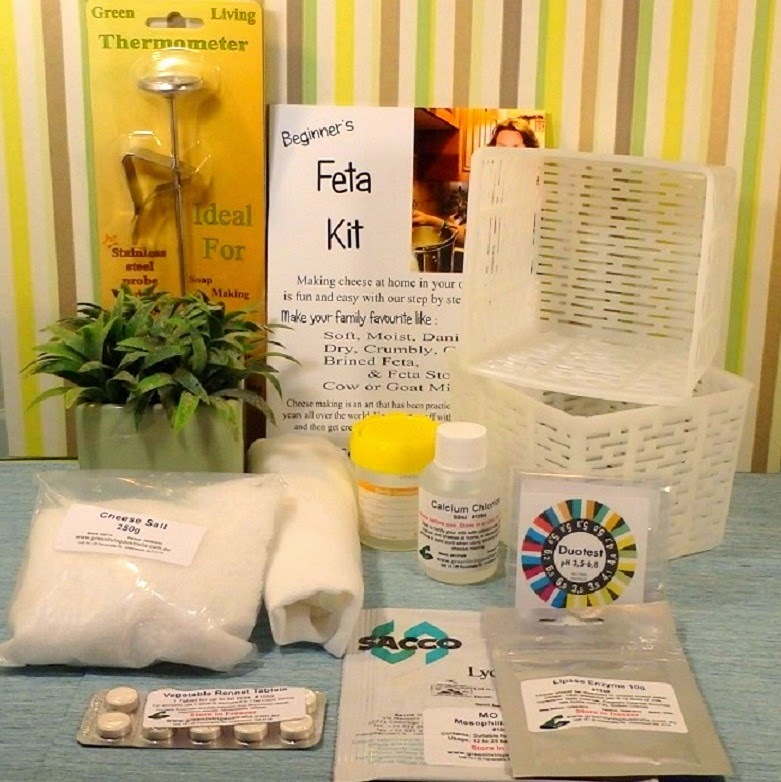 Back in 2009 I attended my second cheese making course. This one was for mould ripened cheeses and I hoped that I could be making Stilton cheese. I was very excited, and didn’t sleep very much last night. The course was held at our local community house, and started at 10am. A most civilised start time for a Sunday, I thought. There were 8 people on the course, and I knew one gent called Kasper who I met during my first course. He also has made many different types of cheese as I have since the first course in February, and we both have the cheese making bug.I was able to make Stilton, which is an English Blue vein cheese. You can read how they make it commercially at the Official Stilton Cheese Makers Assoc page. 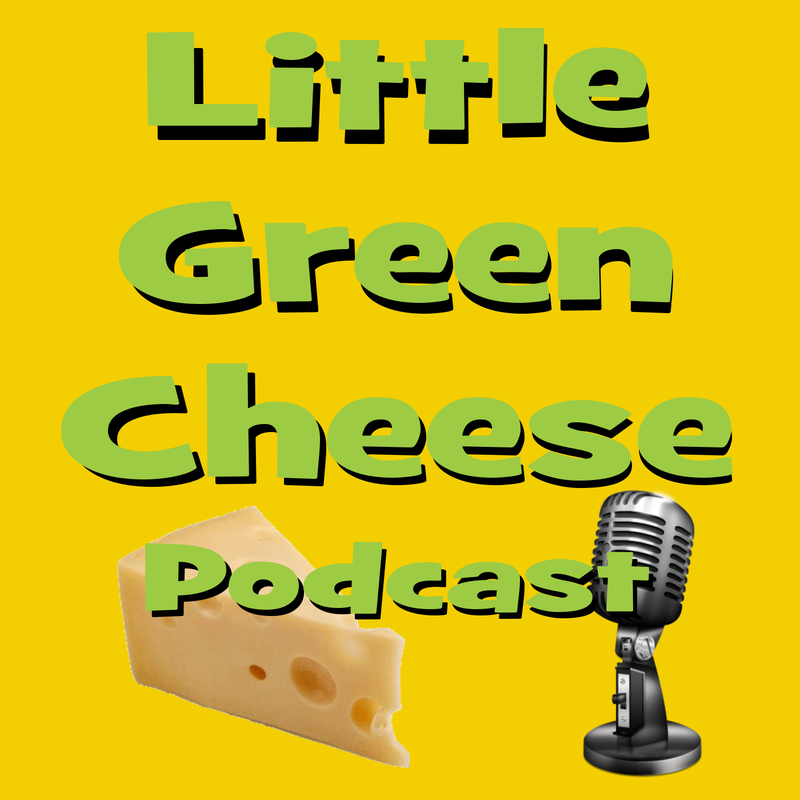 Here is a little history of the cheese. It has an uncanny link to my town of Melton. Stilton was first made in the early 18th century in the midlands of England – specifically in and around the Melton Mowbray area. Stilton takes its name from the village of Stilton (though no Stilton was ever made there) located about 80 miles north of London on the Great North Road. It is here that the coaches travelling from London to Scotland and other northern cities made their first stop for fresh horses and overnight stays. Convenient to Melton Mowbray and the surrounding area, the village became the central marketplace for the cheese with thousands being sold every week. Thus the blue cheese one would buy in Stilton became known as Stilton cheese. Well there you go. Stilton was never made in the town of Stilton! Anyway, history lesson over. It was a fairly simple recipe, and started off the same as making most hard cheeses, bringing up the temp to 32°C, add the Calcium Chloride, add the Mesophilic culture, and then the Penicillium Roquefort (the smelly stuff) to the milk. After 30 minutes I added the rennet and let set for about 45 minutes. After cutting the curd with a whisk into about 4-6mm squares, it was rested again and then the whey was drained off to the level of the curds. That is when it all went to custard and down hill from there. After another 30 minutes of resting, I drained it through a cheesecloth and it was still very moist. I had to leave it in the cheesecloth and press it with a pot filled with water to get more whey out of it. I then took it out of the cheesecloth, broke it up into smaller pieces and sprinkled 2 teaspoons of salt over the top and mixed it through. I thought it was still quite moist, but because we couldn’t really follow the recipe properly because of the time limitation we attempted to press it in the hoop. It did not like it very much and oozed out of the sides of the follower. Still too much whey in the curd. I had to return it back to the bain marie and heat the curd until more whey was released. Normally you would just leave the curds to drain a few hours in the hoop and add more when it shrank by itself. 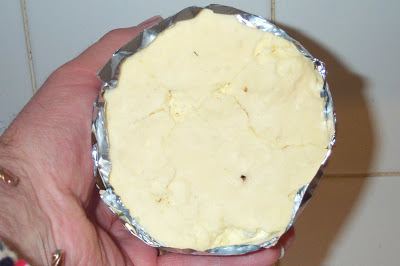 The heating process released a lot of whey and the curd became very rubbery. Hopefully I didn’t kill the cultures. The cheese itself looks a bit abnormal, lopsided and rough. It didn’t press very cleanly. We all cleaned up our gear and were finished by about 2pm. Here is the finished product at home, which looks like the Leaning Tower of Pisa. I bought a special container that has a rack in it to mature the cheese in, because we were told not to leave mould-ripened cheese in a fridge with normal cheese unless we wanted strange moulds all over our nice cheese! I rubbed salt liberally over the cheese, and I turned the rack upside down, put a bit of water in the bottom of the container (to raise the humidity to 85%), and pierced the cheese with about 30-40 holes top to bottom and bunged it into the cheese fridge. 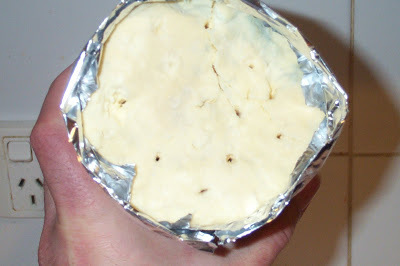 The first Stilton I made turned out very mouldy all over and I wrapped it in foil with the ends exposed to encourage mould growth in the holes. It smelled fantastic, and we ate it within days of maturity. It looks a bit squished, but that is how it came out of the cheese mould. As for the second Stilton I made, it turned out to be a bit too dry and cracked in half. I have had to wrap it in foil early to get it to keep together. 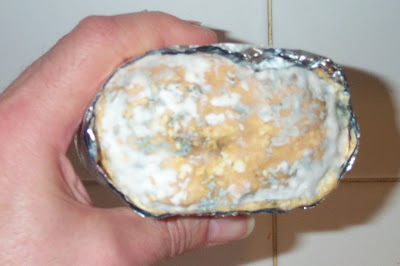 In this photo it is just showing signs of blue mould growth at the top. You can see the crack better in this picture. I nearly cried, until I remembered watching how they wrapped Roquefort cheese in thick tin foil in France. Before I wrapped the cheese it was laying in half on the bottom of the ripening container. To tempt your taste buds further, here are a few shots of the 3rd Stilton that I made. It had been maturing for the last 4 months. Once again, homemade blue cheese is simply divine. It had a nice, strong rind, with lots of marbling inside. I went crazy with the piercing it this time as I wanted lots of veins in the wheel. I put in about 40 holes. It clearly worked well. Click to enlarge any of the photos to get right in there. Kim and I sampled this small piece with a few crackers and local cherries. The flavour combination was amazing. We love this cheese! In summary, making Stilton cheese or any blue cheese for that matter is not that difficult to make. You just have to set up the right conditions for it to grow the mould successfully.